ARS receives research grant SONATA BIS from the National Science Centre in Poland! Wojciech Drożdż succesfully defended first PhD thesis in our group! Congratulations! 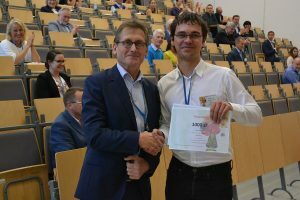 Our PhD student Grzegorz Markiewicz was awarded for the best poster on the conference Chemistry Beyond Nature – congratulations! [Photo] Grzegorz recieving award from prof. Ben Feringa, special guest of conference and Nobel Prize winner in 2016. Michał Kołodziejski and Grzegorz Markiewicz are winners of PRELUDIUM GRANT – congratulations! Grzegorz Hajdaś, Sylwia Bugajewska, Mateusz Gierczyński and Igor Grządzielewski joined our research group, welcome! Ania and Wojtek are the winners of PRELUDIUM GRANT – Congratulations ! ARS is a finalist of 16 Scientific Awards by POLITYKA Magazine (16. edycja Nagród Naukowych POLITYKI). ARS is one of 15 Polish young researchers awarded for their research efforts. Dr Monika Wałęsa-Chorab joined our team to work in the LIDER project. Miłosz Piechocki has been selected as a director of departamental Scientifc Association of Chemists – congratulations ! New papers in Chemical Science and Catalysis Communications have appeared. Grzegorz Markiewicz is a laureate of scholarship from the Ministry of Science and Higher Education – congratulations ! 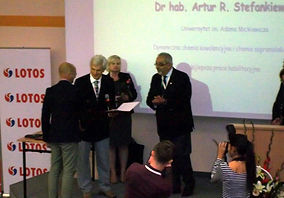 ARS received prize from Polish Chemical Society for the best habilitation thesis in 2014 ! Book chapter entitiled: „Anchoring Metallosupramolecular Materials on Solid Substrates: Specific Surface–Molecule Interactions and Self-Assembly” in the RSC Smart Materials series has been published. Our article in the IJMS has been selected for Cover ! Ania, Wojtek and Michał entered PhD course ! Congratulations ! Ola, Wojtek and Michał passed their Master Exam ! Congratulations ! Invited paper in the International Journal of Molecular Sciences has been accepted for publication ! Gracjan Kurpik and Lidia Wawrzyniak joined our research group, welcome ! ARS receives research grant Iuventus Plus from the Ministry of Science and Higher Education ! Magdalena Piasecka joined our research group, welcome ! Part of the ARS group will be located at the Wielkopolska Center of Advanced Technologies ! Grzegorz Markiewicz, Anna Brzechwa and Magdalena Mocek joined our research group, welcome ! ARS gives lecture as an invited speaker on the 6th International Symposium on Nano and Supramolecular Chemistry 2014 in Bali. ARS receives research grant LIDER from the National Center for Research and Development ! ARS, Michał and Wojtek attended NanoFunMat conference in Pułtusk. ARS receives his habilitation degree for his work on „Application of supramolecular and dynamic covalent chemistries in the development of complex chemical assemblies”. Michał Nowakowski and Sandra Pancer joined our group as starts bachelor students, welcome ! Joanna Kamińska, Monika Wrzaskowska and Natalia Wójtowicz starts as a bachelor project student in our group, wellcome ! Michał and Wojtek recevied conference grant from the UE funding program HCOP, congratulations ! Wojciech Drożdż joined our team, wellcome ! ARS together with Jeremy Sanders and Sam Black published Chem. Soc. Rev. paper on supramolecular reactivity in disulfide systems. Ola Wrotecka and Michał Kołodziejski joined our research group, wellcome ! ARS received HOMING PLUS grant from the Foundation for Polish Science and set up his research group in the Department of Chemistry at Adam Mickiewicz University in Poznań !